VAN DIEMEN'S LAND, Bank of Van Diemen's Land, cheque, 27 March 183, Cashier of the Bank, pay to 'E.P.Robinsons' or bearer the sum of 'thirty nine pounds 19/5' Sterling and place the same into the account of James Kelly. Top right corner missing, small centre spike hole, two pin holes, edge tears, very good. James Kelly (1791-1859), sealer, pilot and harbourmaster, was born on 24 December 1791 in Parramatta. He travelled extensively including circumnavigating Van Diemen's Land, and discovering Port Davey and Macquarie Harbour. Kelly was appointed pilot and harbourmaster at the Derwent and later as pilot he was engaged in whaling and with additional land ownership he became an important citizen in Hobart. Kelly suffered personal and shipping losses in the 1830s and by the 1840s with the depression his losses were heavy forcing him to assign his property to creditors and later accept employment from the port authorities again. He died in Hobart on 20 April 1859. 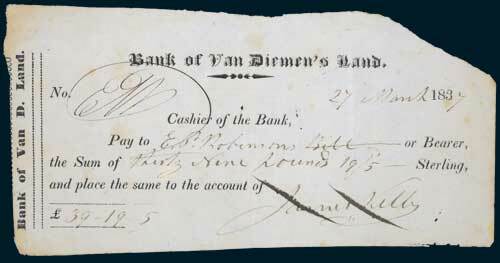 Bank of Van Diemen's Land founded in Hobart in 1823 it closed on 4 August 1891.